In Kerala filmdom Jayram is known as the safest bet and his films rarely flop at the box office. Having started out in late Padmarajan's Aparan he went to be the favourite of the family audience and his recent films like Friends and Kochu Kochu Santoshangal were big hits. He is married to actress Parvathi and is proud father of a son who recently acted in Kochu Kochu Santoshangal. He was recently seen in Thenali with Kamalhassan in Tamil.He speaks about his career and future moves. Don't you feel that you have been typecast as a hero of family dramas? Yes, Rajasenan and I together gave lot of hits with subjects that are aimed at family audiences. Our movies have few comedians, a heroine and a storyline, which attracts the families. 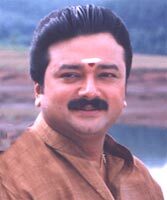 All Rajasenan and Jayaram movies have been hits. And this has made me typecast as a hero of family dramas. It was due to this that I decided that I will not act in Rajasenan's films for sometime and I am looking for a break. But to tell you the truth this family subjects are my bread and butter. I have no choice and I think if I have to do something that will be to my liking then I think I will have to produce a film (laughs). (Guffaw) I know to act and I will not do anything else .Yes, I will sing if anyone asks me to. You have a film with Jayraj, which has you in Kunjan Nambiar role. Bharathan planned it before his death and now his sishya has taken up the role. Do you know that there is lot of reference material on Kunjan and so one has to be very careful about doing it. After the success of Thenali you might be doing a few Tamil films? In fact I am keeping away from Tamil films because it takes lot of time to complete and here in Kerala they will say that Jayram has shifted to Tamil films. If in Chennai my film flops I will be thrown out saying that a Malayali has failed. So why the risk? Better to do in a place where you have a steady market. I have finished Anil Babu's Uthaman, which I think will provide me a change of image of the family man. Let's wait and see. My next is Rajiv Kumar's Vakalath Narayanan Kutty. Most of the other projects are yet to take off. Why is that the Malayalam films are flopping rapidly? What we are giving on big screen is coming on small screen too and so you have to be bigger and better to pull the audience towards the theatres. Secondly, we don't have enough writers to bring out new subjects. Thirdly, we fail to market the films effectively. On the whole the film business is in a slump. Sometimes your mannerisms remind me of Prem Nazir? (Laughs) Yes, I lived for a long time imitating Nazir saar on stage and mimicry shows, till I came to films and maybe it comes out at times. Will your son act in films? He acted in Kochu Kochu Santoshangal and the result is that from the second rank he slipped down to the 20th rank and Parvathi has put a stop to his acting career.